The Sheraton on the Falls is a modern 4-diamond hotel located in Niagara Falls, Canada. 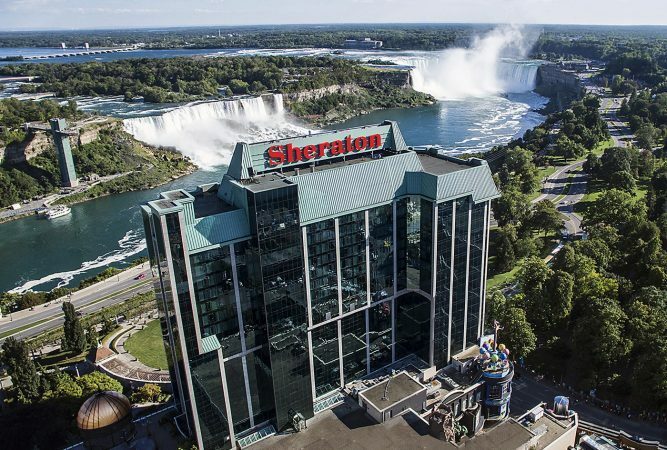 As the cornerstone of the 20 acre Falls Avenue Resort, the Sheraton is located in Niagara’s premier Fallsview tourist district providing the best Fallsviews guaranteed! The Sheraton on the Falls Hotel is directly connected to some of the best attractions located in the Niagara Falls Tourist area. These include, the Fallsview Indoor Waterpark, Adventure City, and Hershey’s Chocolate World Niagara Falls. Situated only one block from the Falls, the Sheraton is also located near Hornblower Niagara Cruises and other Niagara Parks attractions.